BSNL has launched two FTTH broadband plans that offers ultra-cheap bandwidth for subscribers under FTTH segment. Business Telecom and 4G technology service provider BSNL launches two new Fibro Combo Unlimited plan Rs.777 and Rs.1277 which offers a data FUP of 500GB at a speed of upto 50Mbs and 750GB data at a speed of upto 100Mbps. As per latest information, high broadband speed provider BSNL Fibro Combo ULD 1277 offers Unlimited free data usage upto 750GB with 100Mbps speed following FUP and thereafter broadband speed reduced to 2Mbps automatically. At monthly rental broadband setup at Rs.1277/- can avail 100Mbps speed, 1GB space of one Free Email ID under FTTH broadband plans. In addition broadband internet subscriber also get one additional benefit of 24 hours unlimited free calling (Local/STD) voice calls to any network within India. However broadband internet connection provider will collect one month rental charges against security deposit. 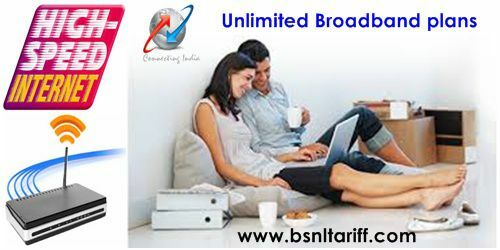 In addition, broadband network BSNL also provides flexibility payment option of One year Rs.14047/-, Two years Rs.26817/-, Three years Rs.38310/-, under this payment option broadband plan user also get monthly rental discount upto one, three, six months. The above broadband offer and broadband plan will be implemented with effect from 12th June, 2018 onwards in all Telecom Circles on promotional basis for a period of 90 days under broadband segment.